The arrival time in Keflavik airport depends on where the guests will be coming from. They will be welcomed at the airport and transferred to a beautiful country hotel where the group will stay for the next 2 nights. 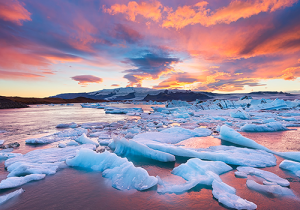 On the way they will be enjoying beautiful scenic landscape; rough lava fields, the powerful ocean, mountains and soft green hills occupied with typical Icelandic farms. At the hotel the guests will be offered some light refreshments and afterwards they can relax in one of the jacuzzis with geothermal water and enjoy the beautiful surroundings until everyone of the group has arrived to the hotel.Informal buffet dinner will be served at the hotel restaurant where the chef takes special pride in using the local ingredients to make the most tasteful dishes. After a rich breakfast, there will be a line of heavily modified Ford Excursion long 4 wheel-drive super jeeps waiting outside the hotel. Only 20 minutes away is Thingvellir national park. Home of Iceland’s parliament from 930-1798. Thingvellir is also the point on Earth’s surface where the North Atlantic ridge splits the two geological continents of North America and Eurasia. In the mind of most Icelanders this is the place where the heart of the nation beats, being the scene of number of historical events. After Thingvellir the convoy of jeeps continues towards the glacier Langjokull. 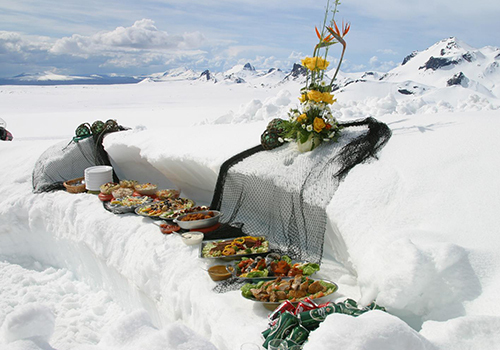 Once at the roots of the glacier, a special 8 wheel drive monster truck takes the group up on the ice cap glacier, where a “surprise” buffet lunch awaits and later to enter and experience the longest and most unique ice caves in Europe. The buffet table has been carved out of the glacier just before the arrival of the guests so it is unique and fresh offering delicious food and refreshment. After the very special experience the guests will continue their adventures exploration on the famous Golden circle route, Gullfoss (the Golden Waterfall) and the Geysir´s area.Gullfoss, the Golden Waterfall, is one of Iceland’s most spectacular waterfalls. 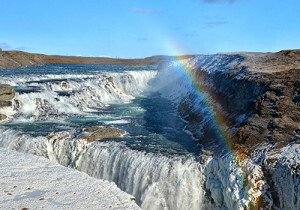 Gullfoss, the Golden Waterfall, is one of Iceland’s most spectacular waterfalls. It falls 32 meters in two stages, with water coming from the glacial river Hvítá, which has its source underneath the glacier Langjökull, and flows 133 kilometers into the Atlantic ocean. Through the centuries the people in the locality have had strong emotional ties to the waterfall. Among them was a young woman, Sigriður, whose father owned the land the waterfall was on. She loved the falls dearly, so much so that when it was decided in the early 20th century to harness its energy for a hydroelectric power plant Sigriður vigorously protested and walked all the way to Reykjavik to try and have the project stopped. It´s said that she even threatened to throw herself into the falls once construction on the plant would begin. Luckily, the plan to build the plant was never realized and so Sigriður lived to a ripe old age and the waterfall´s magical beauty is still there for us to enjoy. The last stop of the day is the famous Geysir ´s area. The Great Geysir, or Stori-Geysir, has for centuries been one of the greatest natural attractions of Iceland and where these natural phenomenons, “geysers”, get their name from. Since Great Geysir has been dormant since 1916, the main attraction of the area is now Strokkur (The Churn), another geyser 100 meters south of the Great Geysir, which erupts at regular intervals every 10 minutes or so. 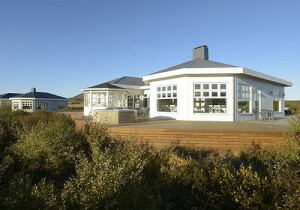 On the way to Grimsborgir hotel, the group will be having a 3 course dinner at the beautiful hotel Ranga restaurant. After breakfast, the super jeeps will again be waiting outside the hotel and the group will be heading along the south coast towards the Glacier Lagoon. The tour is certainly a feast for all senses, as the beauty of the nature is breathtaking. The glaciers and dormant volcanos remind us of power of nature. Different kind of noisy cliff birds, soft sound of waterfalls, the smell of sulfur from the hot geothermal water. On the the will be a stop at Reynisfjara, the black lava sandy beach for a rich and tasteful pic-nic lunch. 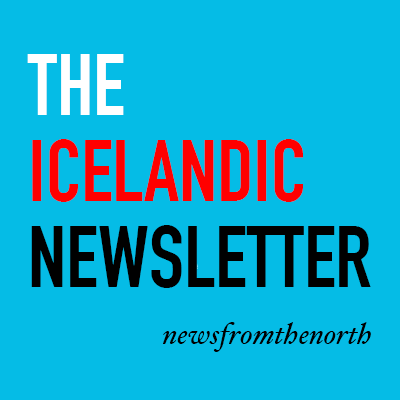 Before the group reaches the Glacier Lagoon the jeeps will cross a huge black sand plain with powerful glacial rivers, that in the history of Iceland kept the people living on each side of the rivers completely separated, more or less until the first bridge was built in 1974. At the glacier Lagoon the group will experience a unique boat trip on a rib booat between the huge icebergs. so close that they can actually be touched. Only a short way from the Glacier Lagoon awaits the group´s hotel for the night, wherefrom the view of the great Vatnajökull glacier is magnificent. 3 course dinner at the hotel´s restaurant. After breakfast the guests will be transferred the short distance to the domestic airport for the flight to the capital of Iceland, Reykjavik. During the flight the guests experience the the birds view over glaciers and volcanoes. After check in at hotel well before noon, they have the day at their own leisure or the option of choosing one of the following activities. Please notice that all the activities must be booked in advance. 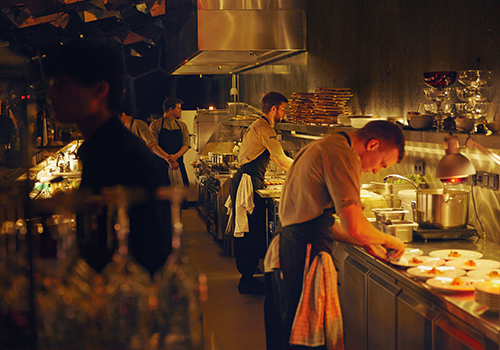 For the last night dinner, we are recommending restaurant Kolabrautin at the Harpa concert hall, where the midnight sun light and view over the sea is exceptional – and the food is excellent. The airport transfer departs from the hotel 2 ½ -3 hours before each departure of international flight from Keflavik airport. 1 activity of choice per person on day 4 as listed above (some extra fee may apply). Flight tickets, alcohol drinks other than wine, special treatments at the Blue Lagoon, lunch on day 4. Local Guides – we strongly recommend 2-3 guides for the tour, 1 or more languages . International flights.